Distinguished Authorship. 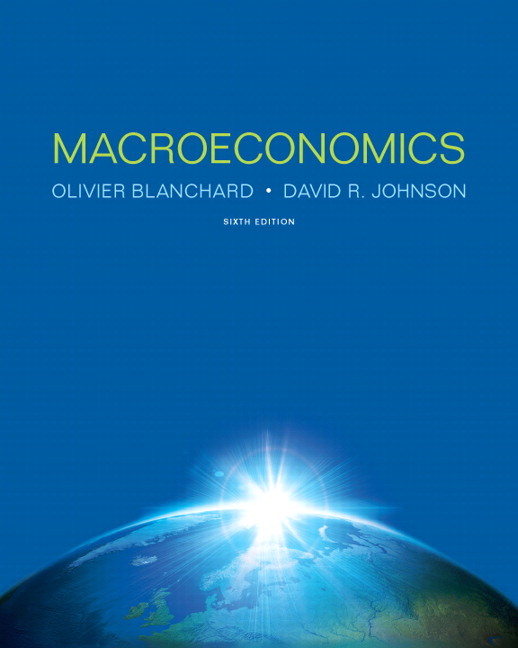 Olivier Blanchard is one of Pearson’s most notable economics authors and brings his years of experience and research of macroeconomic issues, including time as the chief economist at the International Monetary Fund, to the text. Comprehensive coverage of current events. Current macroeconomic events (such as Changes in the U.S. Natural Rate of Unemployment since 1990) are integrated into each chapter of the book within the text and detailed boxes. Each box shows students how they can use what they’ve learned to get an understanding of economics in the real world. Implications of the Equilibrium Model. Blanchard offers a unique, underlying model that shows the implications of equilibrium in three sets of markets: the goods market, the financial market, and the labor market, helping students understand the impact of equilibrium. UPDATED! Figures and tables have been updated using the latest data available. Short, flexible chapters provide plenty of opportunity for alternative course organization. Margin notes create a dialogue with the reader, making the more difficult passages easier to comprehend, and giving a deeper understanding of the concepts and the results derived along the way. Short appendixes to some chapters expand on points made within the chapter for students who want to further explore macroeconomics. A summary of the chapter’s main points. A list of key terms. A series of end-of-chapter exercises. “Quick Check” exercises are easy. “Dig Deeper” exercises are a bit harder, and “Explore Further” typically require either access to the Internet or the use of a spreadsheet program. A list of symbols on the back endpapers makes it easy to recall the meaning of the symbols used in the text. REVISED! Presentation of the IS-LM. The traditional treatment of monetary policy assumed that central banks chose the money supply and then let the interest rate adjust. Now however, central banks choose the interest rate and then let the money supply adjust. In terms of the IS-LM model used to describe the short run, the LM curve, instead of being upward sloping, should be treated as flat. This makes for a more realistic and a simpler model (Chapter 5). NEW! Focus on the role of the financial system in the economy. The text extends the IS-LM model to allow for two interest rates—the interest rate set by monetary policy and the cost of borrowing for people or firms, with the state of the financial system determining the relation between the two (Chapter 6). NEW! An IS-LM-PC (Phillips curve) model replaces the traditional aggregate supply and aggregate demand model, and gives a simpler and more accurate description of the role of monetary policy and of output and inflation dynamics (Chapter 9). NEW! Coverage of the constraints on monetary policy, coming from the zero lower bound, and the constraints on fiscal policy, coming from the high levels of public debt, have been added. They characterize equilibrium in the goods market and in the financial markets, and derive the basic model used to study short–run movements in output, the IS–LM model. Chapter 6 is new, and extends the basic IS-LM model to take into account the role of the financial system, then uses it to describe what happens during the initial phase of the crisis. Chapter 7 looks at equilibrium in the labor market and introduces the notion of the natural rate of unemployment. Chapter 8 derives and discusses the relation between unemployment and inflation, known as the Phillips curve. Chapter 9 develops the IS-LM-PC (PC for Phillips curve) model which takes into account equilibrium in the goods market, in the financial markets, and in the labor market. It shows how this model can be used to understand movements in activity and movements in inflation, both in the short and in the medium run. Chapter 10 describes the facts, showing the evolution of output across countries and over long periods of time. Chapters 11 and 12 develop a model of growth and describe how capital accumulation and technological progress determine growth. Chapter 13 focuses on the effects of technological progress on unemployment, and on inequality, not only in the long run, but also in the short and medium run. Chapters 14 through 16 focus on the role of expectations in the short run and in the medium run. Expectations play a major role in most economic decisions and in the determination of output. Chapters 17 through 20 focus on the implications of openness of modern economies. Chapter 20 focuses on the implications of different exchange rate regimes—from flexible exchange rates, to fixed exchange rates, currency boards, and dollarization. Chapter 21 looks at the role and the limits of macroeconomic policy in general. Chapters 22 and 23 review fiscal and monetary policy. Some instructors may want to use parts of these chapters earlier. For example, it is easy to move forward the discussion of the government budget constraint in Chapter 22 or the discussion of inflation targeting in Chapter 23. 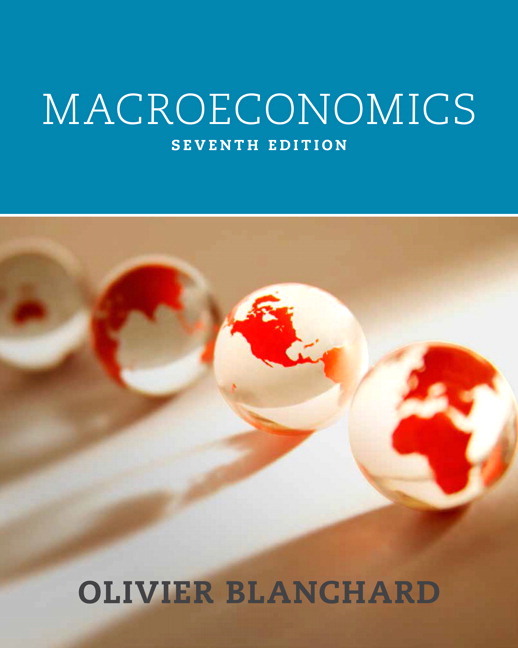 Chapter 24 serves as an epilogue; it puts macroeconomics in historical perspective by showing the evolution of macroeconomics in the last 70 years, discussing current directions of research, and the lessons of the crisis for macroeconomics. Enhanced eText. The Enhanced eText keeps students engaged in learning on their own time, while helping them achieve greater conceptual understanding of course material. The worked examples bring learning to life, and algorithmic practice allows students to apply the very concepts they are reading about. Combining resources that illuminate content with accessible self-assessment, MyEconLab with Enhanced eText provides students with a complete digital learning experience—all in one place. Animation. The key figures in the seventh edition have been converted to digital figure animations where the figures from the textbook are presented in step-by-step animations with audio explanations of the action. The goal of this digital resource is to help students understand shifts in curves, movements along curves, and changes in equilibrium values. Having animated versions of a graph helps students who have difficulty interpreting the static version found in the printed text. Video. There are approximately 100 videos featured in the new enhanced eText for the seventh edition. They provide real-world explanations of key concepts with videos from the International Monetary Fund’s “World Economic Outlook” press conferences and interviews with author Olivier Blanchard. The videos include in-depth market analysis and are accompanied by graded practice exercises to ensure mastery. UPDATED! Real-time Data Analysis Exercises. Easy to assign and automatically graded, Real-Time Data Analysis exercises use up-to-the-minute, real-time macroeconomic data. These exercises communicate directly with the Federal Reserve Bank of St. Louis’s FRED site, so every time FRED posts new data, students see new data. As a result, Real-Time Data Analysis exercises offer a no-fuss solution for instructors who want to make the most recent data a central part of their macro course. Real-Time Data Analysis exercises are available in the latest Principles of Economics (all versions), Intermediate Macroeconomics, and Money & Banking courses. NEW! Math Review Exercises. MyEconLab now offers a rich array of assignable and auto-graded exercises covering fundamental math concepts geared to macroeconomic students. Aimed at increasing student confidence and success, our new math skills review, Chapter R, is accessible from the assignment manager and contains over 150 graphing, algebra, and calculus exercises for homework, quiz, and test use. Offering economics students warm-up math assignments, math remediation, or math exercises as part of any content assignment has never been easier! Practice. Algorithmically generated homework and study plan exercises with instant feedback ensure varied and productive practice that helps students improve their understanding and prepare for quizzes and tests. Exercises that require drawing figures encourage students to practice the language of economics. Learning Resources. Personalized learning aids such as Help Me Solve This, Teach Me explanations of the underlying concept, and figure animations provide on-demand help when students need it most. Study Plan. Customized study plans show students which sections to study next, give easy access to practice problems, and provide an automatically generated quiz to prove mastery of the course material. Digital Interactives. Focused on a single core topic and organized in progressive levels, each interactive immerses students in an assignable and auto-graded activity. Digital Interactives are lecture tools for traditional, online, and hybrid courses, many incorporating real-time data, data displays, and analysis tools for rich classroom discussions. Current News Exercises. These exercises provide a turnkey approach to assign gradable news-based exercises in MyEconLab. Every week, Pearson scours the news, finds a current article appropriate for a macroeconomics course, creates an exercise based on this news article, and then automatically adds it to MyEconLab. Reporting Dashboard. View, analyze, and report learning outcomes clearly and easily, and get the information you need to keep your students on track throughout the course, with the new Reporting Dashboard. Available via the MyEconLab Gradebook and fully mobile-ready, the Reporting Dashboard presents student performance data at the class, section, and program levels in an accessible, visual manner. Learning Management System (LMS) Integration. You can now link from Blackboard Learn, Brightspace by D2L, Canvas, or Moodle to MyEconLab. Access assignments, rosters, and resources, and synchronize grades with your LMS gradebook. For students, single sign-on provides access to all the personalized learning resources that make studying more efficient and effective. Experiments. Flexible, easy to assign, auto-graded, and available in Single and Multiplayer versions, the Experiments in MyEconLab make learning fun and engaging. Focus on the role of the financial system in the economy. The text extends the IS-LM model to allow for two interest rates—the interest rate set by monetary policy and the cost of borrowing for people or firms, with the state of the financial system determining the relation between the two (Chapter 6). An IS-LM-PC (Phillips curve) model replaces the traditional aggregate supply and aggregate demand model, and gives a simpler and more accurate description of the role of monetary policy and of output and inflation dynamics (Chapter 9). Coverage of the constraints on monetary policy, coming from the zero lower bound, and the constraints on fiscal policy, coming from the high levels of public debt, have been added. Math Review Exercises. MyEconLab now offers a rich array of assignable and auto-graded exercises covering fundamental math concepts geared to macroeconomic students. Aimed at increasing student confidence and success, our new math skills review, Chapter R, is accessible from the assignment manager and contains over 150 graphing, algebra, and calculus exercises for homework, quiz, and test use. Offering economics students warm-up math assignments, math remediation, or math exercises as part of any content assignment has never been easier!